Valuable checklist is also available for this product! ISO/IEC 15288:2008 establishes a common framework for describing the life cycle of systems created by humans. It defines a set of processes and associated terminology. These processes can be applied at any level in the hierarchy of a system's structure. Selected sets of these processes can be applied throughout the life cycle for managing and performing the stages of a system's life cycle. This is accomplished through the involvement of all interested parties, with the ultimate goal of achieving customer satisfaction. ISO/IEC 15288:2008 also provides processes that support the definition, control and improvement of the life cycle processes used within an organization or a project. 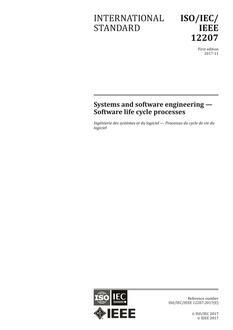 Organizations and projects can use these life cycle processes when acquiring and supplying systems. ISO/IEC 15288:2008 concerns those systems that are man-made and may be configured with one or more of the following: hardware, software, data, humans, processes (e.g., processes for providing service to users), procedures (e.g., operator instructions), facilities, materials and naturally occurring entities. When a system element is software, the software life cycle processes documented in ISO/IEC 12207:2008 may be used to implement that system element. ISO/IEC 15288:2008 and ISO/IEC 12207:2008 are harmonized for concurrent use on a single project or in a single organization.